I have a bit of a habit of sleeping on transport. Some might call it a gift. More than once, I’ve even had people run for insulin because it’s such a sudden shift in consciousness. The Journey has just begun and I’ve already had my first transport nap. Over a bump and a quick jolt shakes me from sleep. Awake now and rambling down the road. Our fully-capable, off-roading vehicle and driver tumble along mostly deserted stretches of desert. Our guide drives like a beast (and sometimes here, that’s very much needed). Looking around the car, I see some of the most fantastic people you’ll ever meet. The landscape around us is breathtaking and feels as if it stretches on forever. We’re headed off to one of the most remote destinations on the planet. 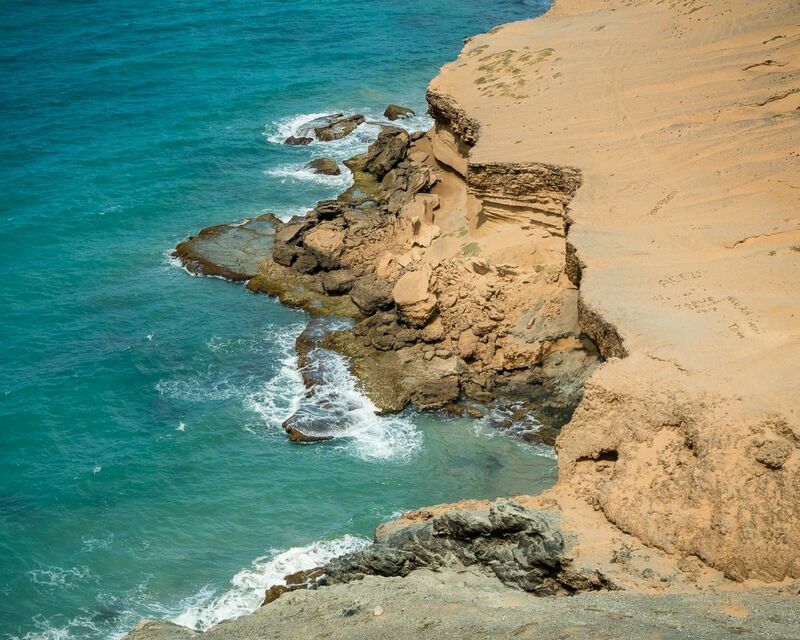 La Guajira is known for it’s otherworldly landscapes, culture, and wildlife. It’s a place like nowhere else on earth. Our guides have spent over an hour in a traditional canoe maneuvering us to our destination. Motors are not allowed here as they would pollute the water and scare away wildlife. We’re treated to a sight that few will ever witness. A close-up with a flock of over 3,000 majestic pink flamingos. We’re back at our lodging for the night just before sundown. It’s a traditional home and our host is one of the best eco guides in the country. He’s particularly enthusiastic about exotic birds. His knowledge of medicinal plant cultivation and use is impressive as well. We get back on our way the following day after being treated to authentic dances, cuisine, and more birding. Our sights are now set on Las Dunas de Taroa. We’re not sure what to expect after such a tranquil and awe-inspiring first day. After another extended off-roading session, we’re stunned when an Sahara style sand dune emerges, towering above us. Our driver pulls up to it and stops. It’s time for us to get out of the A/C and trudge up the hill. We’ve been in the desert for hours and running up the largest sand dune I’ve ever encountered is a bit daunting. What we learned is that it would have been worth it to run up and down 100 times. The view we’re greeted with once we summit will last a lifetime. Completely deserted, pristine beach as far as the eye can see, with only a lone Wayuu pair selling artisanal crafts. This feels like success and we both agree that popping champagne would be the right thing to do. We hadn’t expected this from our planning. We didn’t know what to think about this landscape. It’s a struggle to make a comparison to anywhere on earth. The closest one could get is Mars. Words and pictures only tell so much of the story. The feeling of this place is otherworldly. It begs to be explored. For now, though, we’re tired and want to rest for a bit. We’re content to sit peacefully with the sunset after an afternoon of adventure. Our time here has been so well spent that to be anywhere else seems treasonous. Interested in visiting La Guajira? — Get in Touch to explore your options. Now that the sun has risen once again it’s time for us to wake and explore. We’re at the Northernmost tip of South America and look out towards the open sea. Behind us is a deserted landscape with only a few Wayuu clans who have inhabited this harsh terrain. Most homes are cactus wood structures packed with mud. Our guide tells us that while others might claim more material riches — these people have claim to the sea. In that moment, you feel the entire openness of the world in your chest. Once back on our way, we’re graciously treated to a bit of local knowledge. Punta Gallinas is a turtle sanctuary. There are hatchling releases and other conservation efforts to protect our most precious creatures. The entire community is committed to helping in any way they can. What we feel in that moment is both awe for a traditional way of life and an all too familiar tingle of foreignness. We’re not of the Wayuu tribe and this is not our land. The locals have been kind enough to reveal to us their ways and it is tremendously heart-warming. Before coming to La Guajira we were on edge to say the least. We’d heard rumors about the indigenous culture being cold or distant. Someone had even told us outlandish stories about elaborate eye contact etiquette. What we discovered after extended time with the Wayuu was a kind of laughter. Family is so very important and, yes, traditions are the way of the world. The Wayuu are brothers and sisters and this bleeds through to everyday of life. What was properly expressed before hand was the ruggedness of the area. Anyone coming here should leave behind illusions of spas and paved roads. In order to travel here, the guides need to be well equipped. It’s an expansive desert and good procedures are a must for safe travel. We didn’t take chances here and wouldn’t recommend others take them either. If you are to visit La Guajira it is on her terms and you are along for a ride as an honored guest. Journeying to another planet is not easy, however, it is very much worth it. There are of course ways to make the trip a bit more comfortable for the modern traveler. We uncovered a few lessons learned (the hard way). Drink more water. It’s a desert landscape and the air-conditioning in the vehicles can lull you into a false sense of security. We recommend bringing at least 6 liters of water per person per day in La Guajira — Non Negotiable!!! Have proper expectations about rustic hospitality arrangements. Housing is sparse here and often times it is best to stay at an indigenous home or a locally run inn for sake of cultural integration. In short — accommodations are adequate although basic. Don’t end the trip at Cabo de la Velas (as many people do). This should be the start of your explorations, not the end. Anyone who goes no further has stopped three feet shy of gold after traveling so great many miles. Do yourself the service of giving La Guajira the respect and time it deserves. This journey has pushed us to the limits of ourselves and the world. As we make the long leg of our journey out of La Guajira a moment of reflection seems appropriate. The time and energy we’ve invested here has forever changed our perspective. We’ve had the chance to observe wildlife that few may ever see. An otherworldly (and mostly deserted) landscape has surrounded us for days. We walk where most will never be and carry memories that few will ever have. After a time for good and honest reflection I’m quickly lulled back into a slumber. Something about the roar of an engine. Puts me to sleep every time and it’s not always certain where in the world we’ll be when I wake next. Interested in visiting La Guajira? Get in touch to explore your options.